Heroin removed from Jeep and apartment in New York. Manhattan, New York — James J. Hunt, Acting Special Agent in Charge of the U.S. Drug Enforcement Administration’s New York Division (DEA), Bridget G. Brennan, New York City’s Special Narcotics Prosecutor, New York City Police Commissioner William J. Bratton, and Joseph A. D’Amico, Superintendent of the New York State Police, announced the seizure of 46 kilograms of heroin (141 pounds). On September 26, 2015, a team from the DEA’s New York Drug Enforcement Task Force – comprised of DEA special agents, New York City Police Department (NYPD) detectives and New York State Police investigators – conducted surveillance in the vicinity of 2830 Sedgewick Avenue, Bronx, NY, as part of an ongoing investigation into heroin distribution organizations operating in the Northeast region of the United States. The Special Narcotics Prosecutor’s Office works closely with the Task Force as part of ongoing efforts to intercept bulk heroin shipments passing through New York City. At approximately 3:40 p.m., agents and investigators observed Ramon Rivas and Jose Rodriguez in a silver Jeep Cherokee parked in front of 2830 Sedgewick Avenue. Agents and officers then approached the Jeep Cherokee and engaged Rivas and Rodriguez in conversation. Ultimately, the conversation led to a search of the SUV. 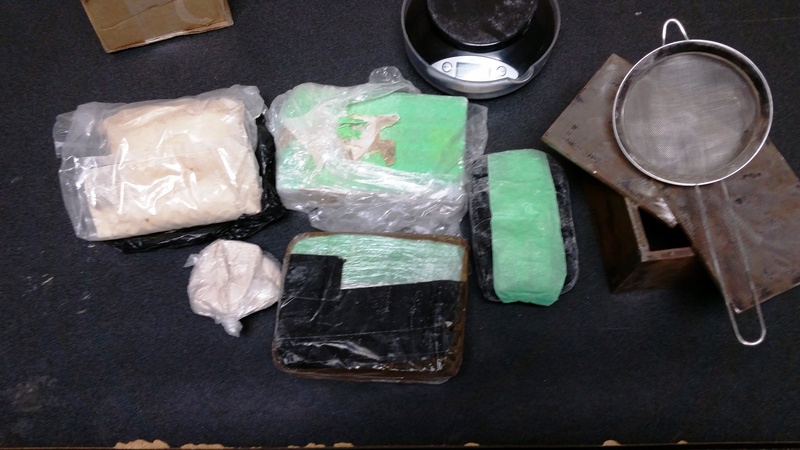 During the search, 48 pounds or twenty-two brick-shaped packages of powder — consistent with heroin — were found in a concealed compartment in the trunk of the vehicle. An initial field test confirmed that the substance was in fact heroin. A subsequent search was conducted at the residence of Ramon Rivas, located at 2830 Sedgewick Avenue, Apt. 1J, Bronx. Two concealed compartments were found in the one bedroom apartment. Task Force members found six kilograms (13 pounds) of heroin in the floor of the bedroom closet and 14 kilograms (31 pounds) of heroin in a concealed compartment in the wall of the entrance-way closet. Agents also found $50,000 in U.S. cash in the wall’s concealed compartment. Heroin seized from storage unit in New York. After searching the apartment and car, members of the Task Force searched a storage unit belonging to Rodriguez located at Public Storage, 400 Nepperhan Avenue, Yonkers, NY, where four more kilograms (nine pounds) of heroin were seized. The Office of the Special Narcotics Prosecutor is prosecuting Ramon Rivas and Jose Rodriguez. A criminal complaint charges both defendants with one count each of Criminal Possession of a Controlled Substance in the First Degree and Criminal Possession of a Controlled Substance in the Third Degree. Rivas and Rodriguez were arraigned in Manhattan Criminal Court, 100 Centre St. yesterday before Judge Robert Kalish. Both defendants pled not guilty. The heroin confiscated during this seizure was valued at $30 million dollars.